February is American Heart Month, and it is the perfect time to talk about preventing unnecessary radiation dose to the heart, often times causing radiation-induced heart disease. When people begin their fight against cancer, they are most likely not thinking about reducing their future risk of heart disease; however, this is certainly something we are thinking about at Provision CARES Proton Therapy. Modern forms of radiation therapy, such as proton therapy, and treatment planning techniques can greatly reduce the risk of radiation-induced heart disease. Of these, the physical properties of proton therapy coupled with advanced delivery mechanisms such as pencil beam scanning, offer superior preservation of the heart and coronary arteries. The clinical statistics for proton therapy patients speak for themselves. Breast cancer patients who choose proton therapy receive 50-83% less relative risk of heart attack or other major coronary events depending on age. 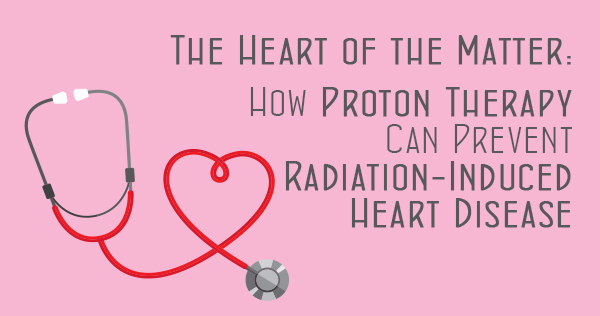 Studies also show a 50% reduction of clinically significant radiation does to the heart when treating with proton therapy. Radiation treatment of cancer near the heart, such as in breast and lung cancer, can lead to unnecessary radiation dose to the heart. Cardiotoxicity, a condition which causes damage to the heart muscle, may present at any point following treatment, but usually present around six months to one year or later. Problems with damage to healthy tissue or nearby organs may include inflammation of the lining of the heart, irregular heart rhythms, congestive heart failure, disease of the heart valves or blood vessels, or cardiomyopathy (enlarged heart). Ultimately, this has an impact on the person’s quality of life, and can lead to a cardiac event such as a heart attack. The risk is directly correlated with radiation dose to the heart. A New England Journal of Medicine 2013 study found that rates of major coronary events increased by 7.4% for every unit of radiation. When patients choose proton therapy, the radiation dose stops at the tumor and spares damage to healthy tissue and organs. Provision CARES Proton Therapy Knoxville is committed to reducing unnecessary risk to vital organs, such as the heart. “I see the initial relief a patient has when told about the protection of the heart that proton therapy provides, and it makes my heart happy seeing patients return for follow-up visits with the doctor and seeing no heart effects from having proton therapy.” – Debra Brady, RN at Provision CARES Proton Therapy Knoxville. Welcome to the Provision CARES Proton Therapy blog. The content here is an extension of our website to help you find the information you need and allows you to keep up with all the things happening at Provision.